Well I managed to almost finish my 5 StuG IIIs this weekend, (some pics on model reviews page) I just need to add a little stowage to make them look used and then paint them, but the last few days here have been a bit to wet for painting as I am banished to the garden shed for that. 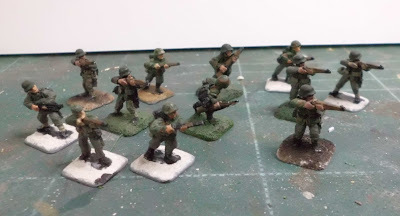 Also started painting my first section of german infantry but my eyes ain't what they used to be. Maybe I should abandon 15mm and try 28mm. Its back to work tomorrow so no more modelling for a few more days.